ÜberConference is conference calling done right. It's simple to join phone conferences without PINs, see who’s in the call and who’s speaking. And now you don’t even need a phone. 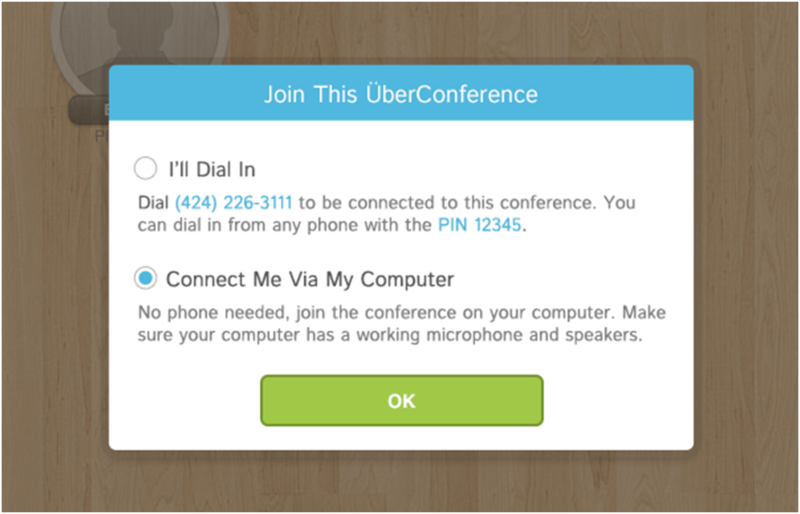 With the launch of WebRTC in Chrome 23, you can “dial into” ÜberConference calls right from your browser. It’s simple, high-quality audio, and it’s free! Just put on some headphones and you are good to go. It’s great for allowing international participants to join your calls without calling a U.S. phone number, and also means you can use ÜberConference from anywhere in the world by calling in through the web. 1) Schedule a conference right now or in the future by clicking the "New Conference" button. Add participants for the conference and any advanced settings and click "Create Conference." That’s it! Now you can have conference calls with anyone, anywhere in the world right from your computer browser using ÜberConference. Note: Your participants are able to connect via their computer as well, when they receive the notification about the conference they can navigate to the URL given to them and choose to connect the same way you did.